The 2019 World Cup in England will remain as a 10-team tournament. Plans to cut the competition from 14 teams have been in place since 2011, but debate over the format of the next edition was opened during this year's event in Australia and New Zealand. The good performance of non-Test sides like Ireland led International Cricket Council chief executive Dave Richardson to say the 2019 event may be reviewed. But the format was not discussed at the ICC annual conference in Barbados. The 2019 tournament in England will be made up of the hosts, the other top seven teams in the one-day international world rankings and two qualifiers from an event in Bangladesh. In theory, that will make it harder for Ireland, who have featured in the last three World Cups and beat Test sides West Indies and Zimbabwe this year, to qualify. The other ICC Associate members who featured in 2015 - Scotland, Afghanistan and the UAE - would also be set for the qualifying event, probably alongside two Test nations. During the 2015 World Cup, which was won by Australia, the likes of India greats Sachin Tendulkar and Rahul Dravid and former New Zealand captain Martin Crowe all stated their opposition to reducing the number of teams involved. Speaking to Test Match Special during the World Cup final, Richardson had said: "As it stands we've entered into an agreement with broadcasters for a 10-team World Cup. "I want it to be a shop window for the best teams in one-day cricket - whether that be eight teams, 10 teams or 12 teams. "We have to make sure we don't put Associate members into tournaments just for window dressing. The debate will still be had as to whether we have 10 or increase it." 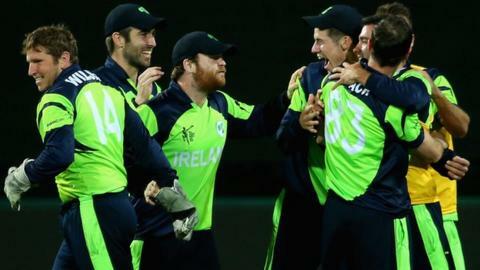 Before the annual ICC conference, Cricket Ireland chief executive Warren Deutrom was optimistic the format could be renegotiated, telling BBC Sport: "One could turn the clock back to 2011, when the 2015 World Cup was set to include only 10 teams but the decision was overturned." However, with 2019 not being discussed in the Caribbean, the tournament will lose four teams despite it being scheduled to last two days longer. The ICC did approve new playing conditions in ODIs and Twenty20 matches, to come in from 5 July. Aussie watch: Who's in Ashes form? Read more on Ashes 2015: Who's hot and who's not for Australia?